This letter was published in the Belfast Telegraph on 7 Feb 2017. Dr John Cameron’s letter of 2 Feb 2017, Climate change report alarmism, not science was useful in that in drew the public’s attention to the UK Climate Change Risk Assessment Report, but his letter was recklessly useless in its comment on it. Dr Cameron makes an number of claims about climate science but offers no credible sources for his point of view. The Committee on Climate Change, who publish the report, draw upon peer-reviewed scientific papers in their work. Their conclusions are based on facts and evidence. Some indisputable facts about climate change are: global temperature has increased 0.85°C since 1880, global sea level has risen an average of 0.19 m in 100 years, and CO2 levels in the atmosphere have increased almost 30% since 1958 (graphs). The last time the CO2 levels were above 400 parts per million was 4 million years ago. 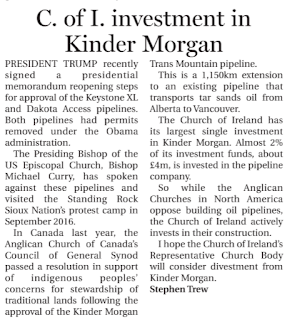 The Church of Ireland invests in oil pipelines in N America while Anglican churches there oppose them. President Trump recently signed a presidential memorandum reopening steps for approval of the Keystone XL and Dakota Access pipelines. Both pipelines had permits removed under the Obama administration. The Presiding Bishop of the US Episcopal Church, Bishop Michael Curry, has spoken against these pipelines and visited the Standing Rock Sioux Nation’s protest camp in September 2016. In Canada last year, the Anglican Church of Canada’s Council of General Synod passed a resolution in support of indigenous peoples’ concerns for stewardship of traditional lands following the approval of the Kinder Morgan Trans Mountain pipeline. This is a 1,150 km extension to an existing pipeline that transports tar sands oil from Alberta to Vancouver.